One of the best loved spy stories has been a big hit on the big screen, television, West End and Broadway and now it comes to Harborough Theatre. Market Harborough Drama Society will perform the theatrical version of The 39 Steps from Tuesday July 5 to Saturday July 9. The play is described as an homage to the film and novel of the same name with Patrick Barlow using Alfred Hitchcock’s 1935 black and white version starring Robert Donat as the inspiration. Follow the incredible adventures of our handsome hero Richard Hannay, complete with stiff-upper-lip, British gung-ho and pencil moustache. He encounters dastardly murders, double-crossing secret agents, and, of course, devastatingly beautiful women. This gripping comedy thriller features four fearless actors, playing 130 roles in 100 minutes of fast-paced fun and thrilling action. It opened at London’s Tricycle Theatre in 2006 and soon transferred to the Criterion Theatre, where it plays to this day. In 2007, it opened on Broadway and has since played in over 39 countries. 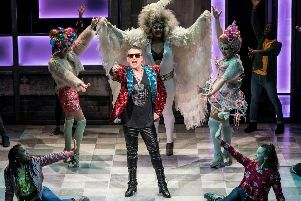 The parts are all performed by just four actors and will see rapid costume changes, imaginative use of props and set, accents as well as physical and comedy. The show is the final one of the drama society’s 2015/16 season which has seen a wide range of works performed by the society including pieces by Alan Bennett and Harold Pinter. Performances start at 7.45pm each night with a matinee performances starting at 2.30pm on Saturday. Tickets cost between £7.50 and £10 and areavailable www.harboroughtheatre.com or from the box office atthe theatre, in Church Square, Market Harborough on Tuesday and Saturday mornings.